It is a proven fact that our moon has an influence on fish. We know that the gravitational pull from the moon is the greatest influence on tidal activity found in the oceans. It is a natural observation that because the depth of the water fluctuates daily, saltwater fish will be influenced by the tides. We know from science that the bigger the body of water, the bigger the tidal influence. But what about fish in smaller bodies of water? What about largemouth bass in our home lakes and reservoirs? Is there enough tidal influence in our lakes to affect bass feeding and spawning behavior in freshwater lakes? Many reputable outdoor publications include some sort of table that lists "peak times" according to the moon phases. Writers of these tables claim that wildlife activity is at a higher potential during these peak times. Is there any truth to these tables? Could we improve our fishing by going when the fishing should be best? These are some of the questions I have wrestled with in my fishing career. I've always tried to use a scientific approach to bass fishing. But until recently, there wasn't really a way to prove or disprove the accuracy of the solunar influence. As creator of the Insider BASSlog, I have access to the posts of over 2,400 registered users. Every fish recorded has a date and a time range, so they can be tied together with the solunar information. Additionally, I have been keeping very good records of my catches for the past 5 years or so. In addition to recording the BASSlog information, I give each trip a rating on how good the fish were biting (not just our success in boating them). Since I fish 200+ days per year, that's a good amount of data. I also plan to use the Texas Top 50 list (each fish over 15 pounds) and my own Top 50 bass over 10 pounds. I believe there is enough information to do a series of articles lasting through the entire summer. I haven't crunched all the data yet, but I will share my findings with you as I go. I plan to have Part 2 available next week, so check back often. So far, I got all the moon phases broken down for each date and have the dates linked in with the BASSlog posts. I divided every date into one of five different moon phases — new (no or very little moon), quarter moon, half moon, 3/4 moon, and full moon. 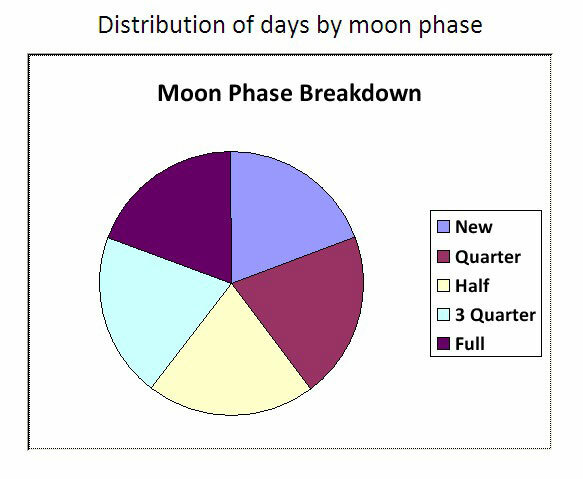 In order to divide the five phases into equal groups, here's the moon percent that made each phase have nearly the exact amount of days. Interestingly, when I queried the entire database of bass, I discovered that there was just about the identical amount of fish in each category. Notice the pie charts below. I was not expecting a uniform distribution of fish in each phase. I know from personal experience on a highly pressured lake that many big tournaments are scheduled around the new or full moon and many fishermen plan their trips around the moons. Most outdoor publications that have charts showing the best dates and times show the full and new moons as the days to fish. I was expecting to see a lot more fish on the full and new moons than the other days — if for no other reason than the fact that more people are fishing then. But just because the same amounts of fish were recorded for each phase does not mean there isn't a lunar influence on bass. In the next few weeks, I will be breaking the stats down further and sharing my results. I believe we will find that there are certain times that are much better on some moon phases than others. I think we will also see that the lunar influence is different depending on the season. We may also see differences under each phase depending on the size of fish we are after, the water clarity, the depth the fish are caught, the geographic location, the sky condition, as well as many other conditions. Be sure to go to the next page for Moon Phases and Bass Fishing, Part 2.